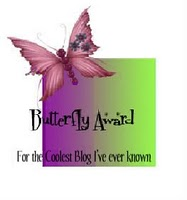 I was just awarded a Butterfly Award from Kacee at You Had Me At Scrap!! She is such a sweet lady and I really appreciate this award! Next Wednesday we are having a Birthday Blog Hop for Kacee's 36th birthday so be sure to mark your calendars! There are some questions I have to answer and then pass this award on! 1) Name your favorite color? I actually have 2 favorites Hunter Green and Dark Blue. 2) Name your favorite song? To Sir With Love is my all time favorite song and movie but when I wand to dance around I listen to the Mama Mia soundtrack. That is the most uplifting music and you can't help but feel bubbly when hearing it. 3) Name your favorite dessert? 4) What wizzes you off at the moment? Fake people. Someone that acts like they know me and like me when they are really interested in what I can do for them. I am allergic to anything with fur so I don't have any pets. My loyality. I will stand beside you until you push me under a bus. I am a pretty easy going person! Being in my craft room creating anything. 12) When you're upset you? Listen to some upbeat music in my craft room. Now I have to pass this award onto others. Anyone else that would like to claim this award is also welcome to. I think that all the bloggers out there deserve it. Everyone that finds inspiration from others and gives inspiration to others deserves recognition so go ahead and grab this award. LOVE your answers, dito on the bus and fake people! Congratulations on getting this wonderful award, and those you've passed it on to!! !